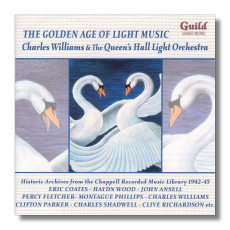 Charles Williams remains an almost mythical figure in the light music genre, ranking alongside contemporary legends such as Haydn Wood, Ernest Tomlinson and Eric Coates. It is significant that there are quite a few pieces by Haydn Wood in this wonderful collection although the mix of composers is as varied as one can imagine. Most of the pieces are by Williams himself and one can only marvel at the simple beauty of such works as 'Marianne', 'Rhythm on Rails' and the energetic 'Witch's Ride'. However Williams also excels himself in the works by Montague Phillips, Eric Coates, Percy Fletcher and a host of other unknown names that really wrote some wonderful music. Being somewhat of an Americanophile, I greatly enjoyed Haydn Wood's 'Virginia', a curious combination of negroe and Irish-Scotch themes whilst the fine sounds of Richardson's 'Naval Splendour' remind one of the glory days of the good old British Navy that was for so long, an integral part of Malta's economy. Fletcher's 'Dancing on the Green' and Eric Coates' 'London Calling' are perhaps the best known pieces on the disc which transcends its 1940's sound with astonishing clarity. Most collectors will note that the bulk of these recordings have already been issued on Dutton Vocalion CDs dedicated to the QLHO but Guild do claim that these transfers are more faithful to the originals and I'm inclined to agree. The budget price definitely tips the balance and I eagerly await more discs from this excellent series which continues to be expertly annotated by the indefatigable David Ades.